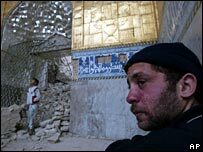 Iraqis have reacted with anger to the bombing of Samarra's al-Askari shrine, which destroyed one of the holiest sites in Shia Islam. The BBC News website spoke to five Iraqis about their reaction to the blast and their fears it could spark a deadly civil war. I'm so depressed about what has happened, people are really afraid here. On Wednesday I was going to my hospital and noticed the police and army were everywhere and people were closing up their shops. Then I heard the shrine had been bombed and I was completely shocked. A patient was also brought in from a nearby Sunni mosque which had been attacked. I rushed home and people were everywhere. There were barriers on the streets and youngsters guarding road entrances. People feared the worst. I heard that Sunni mosques in our area were being attacked so I went to our local Sunni mosque to protect it. At another mosque near my house, people with their faces covered with scarves drove by and began shooting at it, until the neighbourhood people came out with their own guns. Later the situation calmed, but we kept going to the mosque every three hours to monitor it. Our politicians must stop increasing tension in the streets and stop their fiery statements. 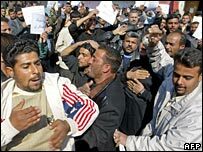 The Shia groups asked for protests which could start more violence. People must try to keep calm and stay in their homes. I am always asked about the divisions in Iraq and I always say there is no difference between Sunni and Shia. I am both - my mother is Shia and my father is Sunni. People here are too busy suffering in their daily lives. When there is no gas for cooking or heating this crisis becomes your priority, not the differences between you and other Iraqis. We were terrified on Wednesday. I came home early from the hospital after hearing of the disaster. There was fighting in the streets and many were killed. My friend called me and said several people were shot dead outside her house. There were people, I think from the Mehdi army [led by the radical Shia cleric Moqtada Sadr], with rocket-propelled grenades running on the streets and taking people from homes. On the day of the attack a crowd of Sunnis protested outside the main Shia mosque where I live, although it is quiet now. I have seen a few American troop vehicles around but they are keeping a low profile. We are worried now, because the Shia are trying to hurt Sunnis in revenge. We are waiting for an investigation by the government into the attack but I am not hopeful. These are the signs of civil war, they are dragging all of us down. This shrine means so much to us Shia. I hope that is will get better - we have gone through so many things and have survived, but it is hard. I am very shocked and this will create big problems for our future. We should try to help each other - if we are still fighting there will be no chance to rebuild. People are very afraid now, everyone's families are trapped in their houses and cannot get out because of patrols and roadblocks. I think after Thursday things will calm down as both Sunni and Shia leaders have called for calm. It is already a little better, myself and my colleagues managed to get to work. I am angry that in Samarra the police and the government ministry had guarded only the Sunni worship areas, not the Shia shrines. They also need to prevent people from protesting in the streets. Now, talk is the best solution for all, but speeches alone will not stop problems. The government should put more guards on the tombs and try to solve the political situation through negotiation, not through weapons. It is a shock for all Iraqis, a disaster. We know it is against us Shia people. The insurgents want a holy war between Shia and Sunni. Now anger is rising within the Shia all around Iraq. This was against our very beliefs. It is our holy place. Later I will be demonstrating peacefully against the attack, as [top Shia cleric] Ayatollah Sistani called on us to do. There have been demonstrations erupting in the streets and we worry some Shia will want revenge. People have been remonstrating with political leaders, saying there is an obligation to take action. Many felt the comments made by the US ambassador to Iraq, when he said aid would not be given to ministries run on sectarian lines, were inflammatory and interfering. Now the most important thing is to give authority back to the interior ministry, the police and the defence forces so they can get the terrorists who did this. Otherwise, it is as if the terrorists have been given a green light to attack. We cannot have bloodshed. I was very unhappy, it seems certain people want to cause trouble between factions. In Samarra most people are Sunnis, but these holy places are Shia and the insurgents exploited the divisions between these two different people. Iraq is unstable and this incident will only increase revenge attacks and the insurgency. It makes you unhappy - why should people be killed and holy places attacked? Many Sunni mosques in Baghdad have been targeted and this will just make war. Here in Suleimaniya, it is mainly Kurdish and most of us are Sunni. There is more peace and the city is stable - the problems we see are only on television. Still, any economic instability in other parts of Iraq can affect us up here, for example the cost of oil or petrol. This could be the trigger for a civil war, so the government must be composed and unify Iraqis.